Medicinal plants (either grown in your garden or purchased) can reduce your dependence on drugs and while some plants are used for treating specific ailments, others have a generalized positive effect on our health. Many herbs belonging to the latter group have since found their way into our culinary scene as flavoring agents. Aloe Vera is well known as a skin-friendly plant and is one medicinal plant people really make use of, since it is generally safe and requires no processing before use. 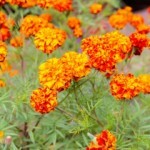 It is a must-have in every garden whether you grow it in pots or in the ground. Aloe Vera plants grow well in a sunny location in warmer areas where there is not much danger of killer frosts. Being a succulent, this drought resistant plant requires very little care and thrives in poor soil. It suckers freely, so you can start with just one or two plants sourced from a reliable supplier. Note: there are several aloes around and not all of them are edible, or have the medicinal properties attributed to Aloe Vera. The jelly-like, colorless pulp of mature leaves can be applied to minor cuts and burns and to dry, inflamed, or damaged skin due to eczema or other skin conditions. It’s an excellent moisturizer with anti-inflammatory and mild antimicrobial effect. The leaf pulp can be eaten too. Regular use can prevent constipation and relieve other digestive problems, including ulcerative colitis and irritable bowel syndrome. This natural hybrid of spearmint and watermint is widely used in dental hygiene products, mouth fresheners, soothing balms and candies. Quite possibly the oldest medicinal herb to be used by man, there’s evidence that peppermint has been used for thousands of years. Grow it in a part of the garden where the plants are assured of water and give it plenty of room to spread. This perennial herb with tiny, aromatic leaves is easy to grow in a sunny location and thrives between rocks and boulders, braving summer heat and winter freezes. The characteristic scent of thyme comes from the volatile oil containing thymol, which gets released at the slightest touch. Many herbs contain this powerful antiseptic phenolic compound, but thyme oil has more than 50% thymol content. The most important use of thyme is to treat respiratory tract infections. 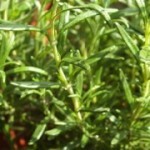 Thyme extract is taken orally to relieve symptoms of bronchitis, chest congestion and mild asthma. Rosemary is more of a woody shrub and although it doesn’t look anything like other mint plants, it belongs to the same plant family. 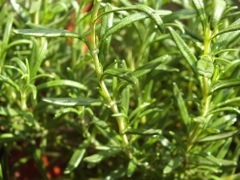 In your medicinal garden, rosemary is stocked for general health and wellbeing rather than for specific problems. Chamomile flower heads can be made into a soothing tea that can calm a troubled mind as well as a colicky baby. Its widespread use across many cultures and for myriad ailments is time-tested, safe and effective. There’s more than one type of chamomile, but we’re going to focus on the Roman chamomile, Chamaemelum nobile. This hairy plant has finely divided leaves and white daisy-like flowers with bright yellow centers, and looks similar to German chamomile, which is why scientific names are important for identifying medicinal plants. You can make a tea from fresh flower heads or dry them for later use. Take a handful of flowers in a bowl and pour boiling hot water over them. Allow steeping for 15-20 minutes and drain. Have a cup of this soothing brew when you feel anxious or unsettled, or before bedtime in case you have difficulty falling asleep. Use it as gargle to relieve mouth ulcers. Bathe the skin affected with eczema several times a day with cooled chamomile tea. A tea made of the flowers can be ingested to ease digestive problems. While none of these herbs should supplant your medicinal regimen prescribed by your physician, it’s always nice to know Mother Nature can be a source for some home remedies. NOTE: Speak with to your physiatrist to make sure none of the above herbs inadvertently have an antagonistic effect on current medications you may be taking. As our population ages, many people need short-term rehabilitation as they transition from the hospital to home. This post-hospital period can be challenging. However, the transition can be much easier if the patient is cared for in a sub-acute rehabilitation setting with close supervision from physicians, nurses, therapists, social workers and other specialists. Whether a patient has had an elective surgery or an unplanned hospitalization, pain management is often the determining factor in the success or failure of these outcomes. In general, the first two weeks after injury are the most intense from a pain standpoint and are crucial for optimal pain management. Patients may need pain medications, often narcotics, in order to maximize their therapy. Improving therapy progress and minimizing comorbidities such as pneumonia and/or skin breakdown are focal points of sub-acute rehab. Comorbidities happen when patients are too sedentary because pain limits mobility. Luckily, most patients are able to significantly cut back on their pain medications and many no longer need pain management after six-to-12 weeks. 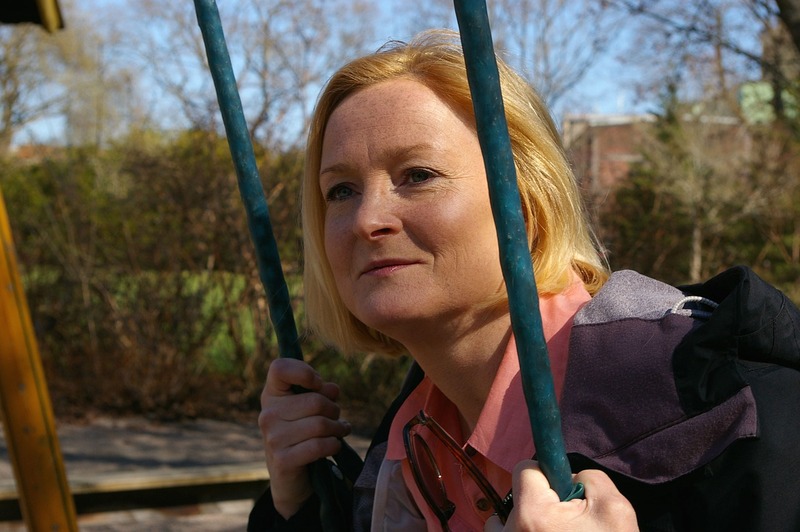 Most people return to their previous activity level by about six weeks. In most cases, a narcotic given at the beginning of rehab allows the patient to actually do more and go home more quickly. There are several myths regarding narcotics, which make patients hesitant to take these pain medications. One of the biggest worries is the concern for addiction. While narcotic addiction is a very serious issue, narcotic use can be safe in an environment supervised by a physician trained in pain management. In sub-acute rehabilitation, narcotics are used as a short-term medication to get over a specific injury with the goal of weaning off the drugs as soon as appropriate. Careful screening is considered when prescribing narcotics. Patient history, physical exam, side effects of medications, history of any personal or direct family addictions are all evaluated. Where addiction has been present, patients will need more education and other pain management techniques to avoid further addiction potential. As board-certified Physical Medicine and Rehabilitation (PM&R) physicians, Drs. Bleiberg and Ruiz monitor patients constantly to ensure minimal side effects. Our team also discusses cases with the patient and, if desired, family members to ensure they are getting the maximum benefit from medication and therapy. Left to their own choices, many elderly patients will fall behind in their pain medication cycle, limiting their progress in therapy. Combined with a change from their normal environment and uncontrolled pain, worsened dementia is also seen frequently in this population. Often, the patient cannot distinguish between pain and other aging issues (loneliness, depression or failure to complete basic tasks in a timely fashion). When patients are in pain, everything comes to a grinding halt; movement becomes extremely limited. Pain medications are sometimes necessary to allow for a maximum effect on patients when they are moving, allowing progress in therapy. When we talk about pain, we must always distinguish between neuropathic pain (pain coming from nerve damage) and nociceptive pain (pain from the injury or surgery). Nerve pain does not always require a narcotic, so a history from the patient is critical in determining the correct medication. A thorough physical exam is also key, as important findings often arise. For example, a thorough exam of a patient complaining of rib pain may lead to finding a rash, resulting in a diagnosis of shingles rather than suspected rib fractures. In a case like this, shingles pain responds better to a nerve pain medication rather than a narcotic. Another important factor to remember is that just taking pain medications doesn’t mean a patient will be completely pain free. Pain management is based on the condition and is best managed by a pain specialist, often times a rehab doctor or a physiatrist. Physical Medicine and Rehabilitation (PM&R) physicians, also known as physiatrists, treat a wide variety of medical conditions affecting the brain, spinal cord, nerves, bones, joints, ligaments, muscles and tendons. Physiatrists maximize what a patient can do and in coordination with therapy, assist the patient in adapting to what they cannot. Why Do Your Ankles Hurt? Known as chronic lateral ankle pain, the recurring or chronic pain you feel on the outer side of the ankle often develops after an injury such as a sprain. However, several other conditions may also cause chronic ankle pain. What are the symptoms of chronic lateral ankle pain? Pain, usually on the outer side of the ankle, may be so intense that you have difficulty walking or participating in sports. In some cases, the pain is a constant, dull ache. According to Th e American Orthopaedic Foot & Ankle Society, the most common cause for a persistently painful ankle is incomplete healing after an ankle sprain. When you sprain your ankle, the connecting tissue between the bones is stretched or torn. Without thorough and complete rehabilitation, the ligament or surrounding muscles may remain weak, resulting in recurrent instability. As a result, you may experience additional ankle injuries. The development of scar tissue in the ankle after a sprain. The scar tissue takes up space in the joint, thus putting pressure on the ligaments. How is chronic lateral ankle pain diagnosed? Have you previously injured the ankle? If so, when? What kind of treatment did you receive for the injury? Are there times when the pain worsens or disappears? Because there are so many potential causes for chronic ankle pain, your health care prodider may need to conduct several tests to pinpoint the diagnosis, beginning with a physical examination. S/he may feel for tender areas and look for signs of swelling, and may have you move your foot and ankle to assess range of motion and flexibility. Your provider may also test the sensation of the nerves, and may administer a shot of local anesthetic to help pinpoint the source of the symptoms. Your health care provider may also order X-ray views of your ankle joint. If needed, you may also need to get X-rays of the other ankle so the doctor can compare the injured and non-injured ankles. In rare cases, additional tests such as a bone scan, computed tomography (CT) scan or magnetic resonance image (MRI) may be needed. Treatment will depend on the final diagnosis and will be personalized to your individual needs. Both non-operative and surgical treatment methods may be used. If you wear high-top shoes, be sure to lace them properly and completely. You’ve heard it before: Laughter is the best medicine. But is this a cliché and what does it mean? Ultimately,”laughter is the best medicine” means that being able to laugh makes nearly everything bearable. Now, scientists are discovering that this is not just an old proverb, but a scientific fact. Laughter brings oxygen into your lungs, which is distributed throughout your body. 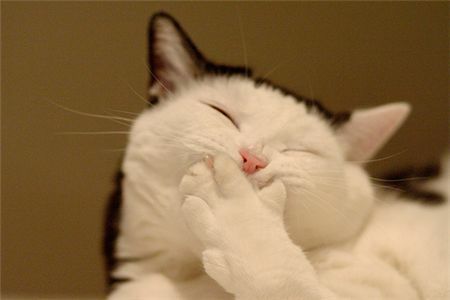 Laughter causes an increase in endorphins. Endorphins are the “happies” in your body; they provide a feeling of contentment and even joy. Endorphins are also increased with vigorous exercise and sexual activity. Laughter can actually be a form of exercise, increasing your heart rate. Laughter can decrease stress, which can then ease the physical responses to stress like muscle tension, headaches and nervous digestive issues. Watch and read funny stuff. Whatever it is that causes you to actually laugh out loud, take time during the day to do it, whether it’s a late night talk show bit, looking at your best friend’s Facebook posts, or watching cat videos. Take time out to giggle. If you face difficult times including acute or chronic pain, seek comfort from others who manage to deal with these issues, while maintaining some semblance of humor. Hanging around depressed people and those who have poor coping skills is not conducive to your mood. Search for more sources of humor. Borrow a great library book written to entertain. Pick up a favorite comic strip collection. Listen to any of the comedy channels on XM-Sirius. Don’t feel that you always have to be “on”. Yes, laughter is healing, but you are allowed to feel sadness and grief over losses and challenges. Try to fit in laughter and see if it helps you. If it does, make room for more and more of it in your daily and weekly routine. The question seems so basic, yet it’s not such a simple answer. Arriving at the correct answer is the most important component to helping you reduce and manage your pain. 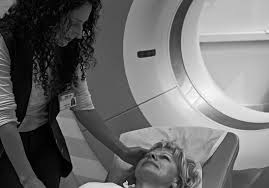 After this first meeting, the doctor may order a battery of exams, including X-rays, MRI’s, CT scans, digital motion X-rays, VAT testing, ultrasound imaging, neuropsychological exams, physical therapy evaluation and even more. It takes time and reflection on the part of Dr. Bleiberg to evaluate you and to arrive at a diagnosis. But the most important thing to remember is that no treatment can begin until the diagnosis is pronounced. In order to not cause more pain or even accelerate a disease process (like a growing tumor), the order is immutable: DIAGNOSIS, THEN TREATMENT! 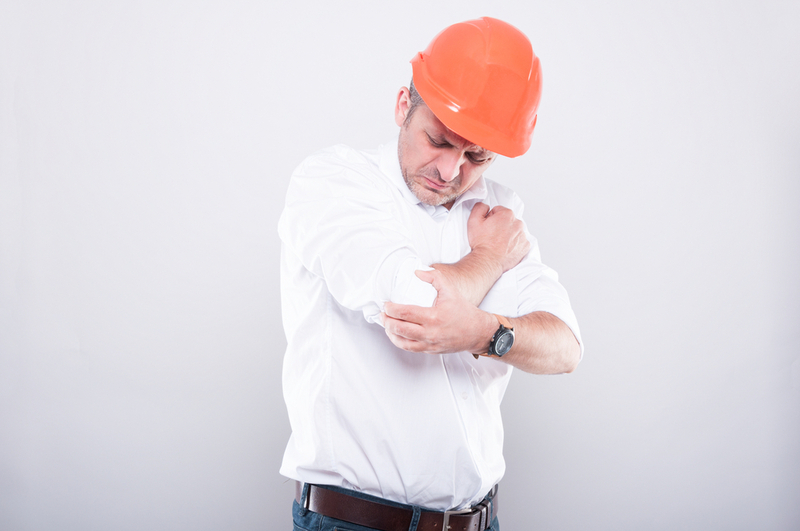 Lots of pain patients want a quick fix or to start treatment right away. But rushing the diagnosis by a medical doctor not only does not help, it can cause harm. Only after a thorough and complete evaluation, can the health care team proceed with beginning to mitigate your pain. Have you ever heard of the placebo effect? A placebo is a pill that has no medicinal value. It is essentially an “empty” medicine. A placebo is a substance that has no therapeutic effect, used as a control in testing new drugs. The placebo effect is that improvement in symptoms of medical research participants, despite their receiving only the placebo. An interesting phenomenon is occurring in United States painkiller drug trials: the placebo effect is increasing. 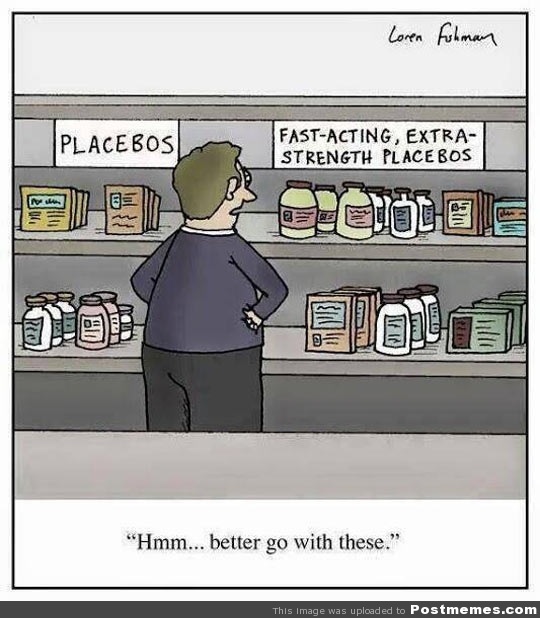 In fact, the placebo effect has gotten so high that many new drugs are not progressing to the next level of research, because their effectiveness at reducing pain does not significantly exceed the effectiveness of study participants who received the placebo. Jeffrey Mogil, who directs the pain-genetics lab at McGill University in Montreal conducted analyses of 84 American clinical drugs that were used to treat neuropathy. These drug trials’ results were published between 1990 and 2013. Beginning in 1996, American study participants indicated that the drug being studied relieved their pain 27% more than a placebo. By 2013, American study participants indicated that the drug being studied relieved their pain just 9% more than a placebo. American consumers are bombarded with drug advertisements promising beneficial results. This may encourage Americans to feel that pills will bring them relief. American drugs in the trial stage are often administered by a nurse as opposed to other nations’ less personal lab settings. The development of the relationship between the study participant and the nurse may increase the placebo effect. Just the act of taking a pill, even a placebo, may be triggering biological functions, specifically the release of endorphins, which dull pain. A recent article in The New York Times discusses the usage of the placebo effect to help pain patients. So many drugs are addictive or have potentially harmful side effects. Could placebo usage be the answer? A drug trial of the painkiller Maxalt gave some interesting glimpses into the possible future of pain relief. Migraine sufferers were actually informed that they were receiving a placebo, and yet they experienced far more pain relief than those who received no placebos. This same study also showed that those who were told they were receiving a placebo but who actually received Maxalt reported less effective pain relief. And those who were told they were receiving Maxalt, but who were actually receiving a placebo, experienced greater pain relief. Fascinating! Perhaps the act of receiving a placebo in a caring setting with a sympathetic health care professional delivering the placebo would be a good alternative for pain relief, one that causes no side effects and no dangers of addiction. For those who wonder why anyone would consider taking a placebo, consider all of those women who utilize 28 day packs of birth control pills. The last seven days of the packet are placebo pills and the women are told that. But the makers and the women agree to take these sham pills, because the most important component of oral birth control methods is taking the pill daily without fail. For women who wish to prevent pregnancy, a daily fake pill that keeps her routine the same every day is worth the ruse. Many people have extolled the values of meditation. Several religious traditions include meditation in their religious practice. Now, medical researchers are embracing the practice as it has proven to be an actual antidote to pain. First, what is mindful meditation? Choose a location where you can sit, undistracted for at least 10 minutes. No screens in the space! Some people like choosing a wall to look at, and many adorn the wall with significant images for them to focus on, whether these are religious symbols, family pictures of even a nature photograph that brings you peace and tranquility. Sit on the floor, on a cushion, or in a flat chair that allows your feet to reach the ground at a 90 degree angle. Make sure that you sit up, that you are not in a position to “wiggle” too much. Keep your eyes open. Mindful meditation is not a “shutting out” but a “tuning in”. Breathe naturally, but without trying to control your breath. Just be aware. Let the thoughts come. Don’t try to force your thinking; rather allow the thoughts to wash over you. You may process some of the thoughts or allow others to just be fleeting ideas. At the end, say to yourself, “I have sat. I have breathed. I have thought”. Try to do this for ten to fifteen minutes and build up to 30 or even 45 minutes. The Journal of Neuroscience has published a research study conducted by Fadel Zeidan, Ph.D., assistant professor of neurobiology and anatomy at Wake Forest Baptist. The researchers delivered minor pain (120 degree heat) to people who do not report regularly feeling pain. The group was divided into four subsets: one group practiced mindful meditation, one practiced fake mindful meditation, another group applied a fake “pain cream” which was petroleum jelly on their skin, and a fourth group had no treatment. All participants were then asked to rate their pain’s intensity and their emotional response to it. In addition, the participants received a brain MRI before and after the pain experiments. The result: the mindful meditation group reported that pain intensity was reduced by 27 percent and by 44 percent for the emotional aspect of pain, much better results than any of the other subsets. The authors believe mindfulness meditation reduced pain by activating brain regions that are associated with the self-control of pain while deactivating the thalamus, which can serve as an entry point, “telling” the brain about sensory information. If you are struggling with pain, see if mindful meditation can be of benefit to you. We would like to hear your results and your suggestions as well.